Today we set sail for the island of Sanday leaving Kirkwall Harbor for good. 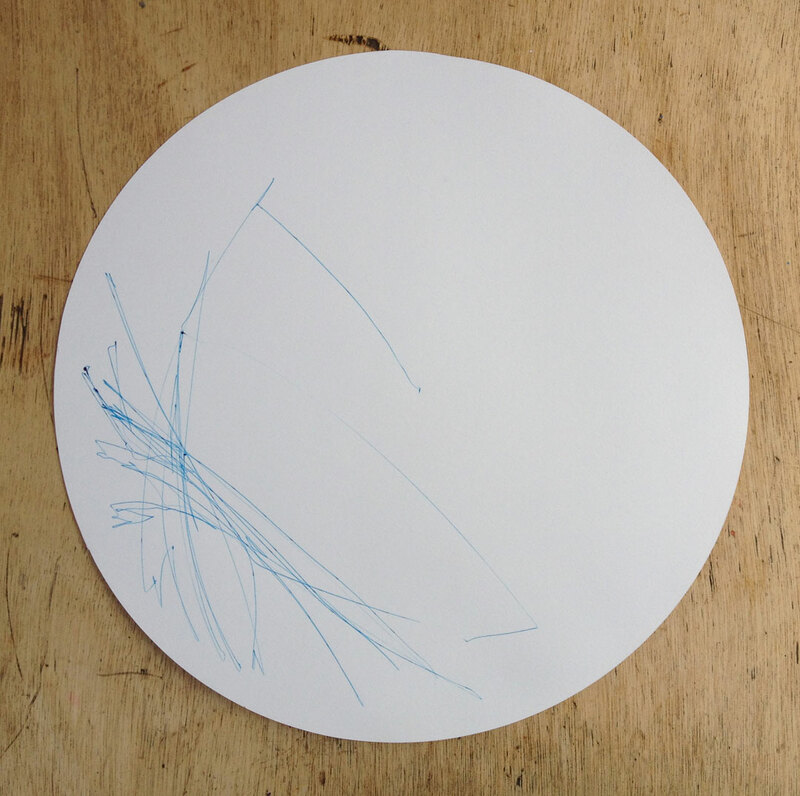 At 11:23, I loaded the drawing machine with Drawing No.01, shortly after we left port. Motoring just outside the walls of the harbor we opened the Genoa Jib and were on our way. Grabbing what little wind we could, the currents proved to be less than expected and we sailed along averaging between 2-4 knots for the first several hours. We sailed past Balfour Castle that stands proudly facing the sea on a grassy hillside on Shapinsay. A few kilometers east of the castle is Helliar Holm Island and its Lighthouse with a picturesque tower and a large lighthouse keepers quarters. Passage through Shapinsay Sound proved slow and steady until we rounded Shapinsay's point. Once around the point we changed our bearing to north and raised our mainsail. The wind and the tides were with us as the sun managed his way out from the clouds. Our speed increased to 10 knots and we marveled at the sea caves and arch known as "the foot". At this point the captain's 10-year-old son, Dylan and myself went out in the zodiac so I could take some photographs of the Selkie under sail. Dylan has grown up aboard Selkie and is no stranger to being the Captain of a dingy. He speed our small vessel out side to side first to the front of Selkie then around again to the back with grace and confidence circling the 58' Selkie as if she were standing still in the water. The light was perfect and beautiful with a brilliant northern sunlight setting the sails aglow as their reflections shown off of the water. Checking on the drawing machine I observed a single steady line that had been drawing, almost tracking our course out of Shapinsay Sound and its calm quiet waters. It had been interrupted by our turn into the wind to hoist the mainsail and our change of course. A few hours later we were sailing between Eday and Sanday with the Calf of Eday on our port side coming into the North Sound. I was at the helm traveling at between 10 - 12 knots and the sea began to change. The tides collide at this point and the waters began to get pretty rocky and felt similar to off-roading on land. The Captain said if the seas were looked like this on a clear day with no wind she couldn't imagine how bad this area would be in a storm. The currents were forcing the rudder in random directions making it hard to stay on course. This patch of sea is quiet evident on the drawing and the juxtaposition between the very single slow etched line to the cluster of marks is a perfect transcription of our trip on this day. After the seas calmed I turned the helm back over and enjoyed the views of the North Sound and of the Island of Sanday that was just off our starboard side. Making our way around its northern side we found anchorage in the bay of Otters Wick.